SR20DET (RWD) ProStock Turbo Manifold. The RWD SR20DET bottom mount turbo manifold has just been finished! This manifold is a must for those looking to extract maximum power and efficiency from their S13 or S14 SR20DETs. - Upper exhaust manifold stud for cylinder #3 may need to be shortened due to extremely close runner clearance. - Thick wall stainless steel construction for reliability and long life. - All flanges machined flat ensuring a leak free seal. - Manifold design allows use of large compressor housings such as a GT25R with a T04S housing. No grinding of the manifold is required. 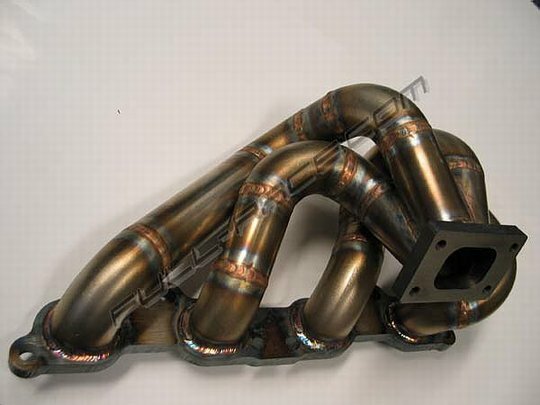 - This manifold is available with a TiAL44mm wastegate flange. External wastegate should only be used on high boost applications only! Internal wastegates are highly recommended for low boost applications.